Attacks on critical information assets and infrastructure can seriously degrade an organization's ability to do business. The most effective risk mitigation requires a solution that combines multiple trusted security technologies working in concert. Providing unparalleled protection for an organization's critical information assets, private firewall software like the Cisco ASA 5500 Series IPS Edition provides best-in-class firewall, application security, and intrusion prevention capabilities in a single, easy-to-deploy platform. Combining the strength and stability of the world's most-deployed firewall technology with the advanced inspection capabilities of the most popular IPS technology, the Cisco ASA 5500 Series IPS Edition protects an organization's servers and infrastructure from attack. Information assets and infrastructure form the core of the modern enterprise. Networked enterprises benefit from increased business efficiency and effectiveness, as well as a sustainable competitive advantage. However, this dependence on the network exposes the organization to risk. The growing number of attacks on the network, in concert with the increasing sophistication of these attacks, poses serious risks to the core business. The Cisco® ASA 5500 Series IPS Edition protects an organization's servers and infrastructure without compromising its ability to use the network as a business tool. With its solid firewall software and advanced application security capabilities, the Cisco ASA 5500 Series IPS Edition provides robust and stable policy enforcement. Market-leading intrusion prevention and antiworm capabilities enable the Cisco ASA 5500 Series IPS Edition to protect assets from sophisticated attacks. Combined with Cisco's management and monitoring application suites, the Cisco ASA 5500 Series IPS Edition provides unparalleled protection of critical assets and infrastructure. Business Resiliency: Prevent disruption of business-critical applications and services due to security breaches by implementing the industry's most-deployed enterprise-grade firewall, IPS, application security, and worm protection technology. Reduce Cleanup Costs: Reduce the costly process of cleaning up after an infection by preventing the infection from occurring. Operational Consolidation: Reduce costs associated with deployment and ongoing management and monitoring of the security solution by standardizing on a single platform for security services. Liability Management: Reduce the company's exposure to liability related to compromised data or inadequate corporate controls by implementing comprehensive access control and threat protection services in a single device. 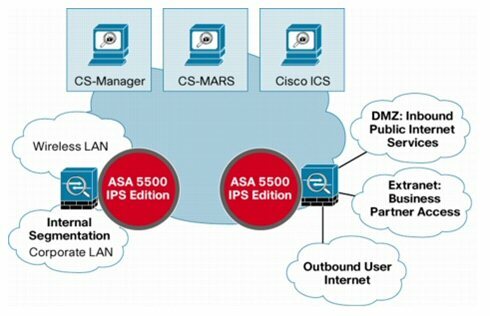 The Cisco ASA 5500 IPS Edition is the focal point of a complete solution for critical asset protection. Tight integration with Cisco management, monitoring, and outbreak prevention systems enables organizations to deploy and maintain a security solution that protects critical assets and infrastructure (Figure 1). 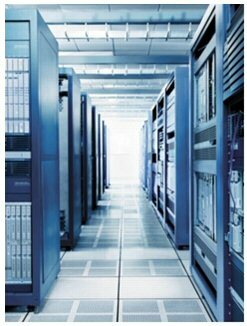 Cisco ASA 5500 Series IPS Edition provides protective services at locations across the enterprise. Cisco Security Manager (CS-Manager) provides an enterprise-grade management infrastructure for large-scale deployments of Cisco security technologies. Cisco Security Monitoring, Analysis, and Response System (CS-MARS) provides real-time monitoring and incident response capabilities, which enable organizations to get the most value from the advanced inspection services of the Cisco ASA 5500 Series IPS Edition. The Cisco Incident Control System (ICS) premium service enhances the capabilities of the Cisco ASA 5500 Series IPS Edition by providing near-real-time updates for the most dangerous worms and viruses. Cisco ICS enables organizations to respond in minutes, in a way never before possible, to new threats by using the industry's most rapid outbreak prevention response system. The Cisco® ASA 5500 Series Adaptive Security Appliance is a modular platform that provides the next generation of security and VPN services for small and medium-sized business and enterprise applications. 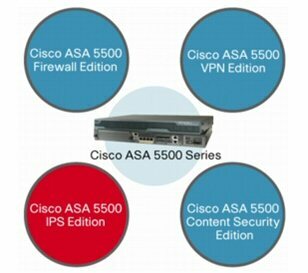 The comprehensive portfolio of services within the Cisco ASA 5500 Series enables customization for location-specific needs through its four tailored package product editions: the Firewall, IPS, Content Security, and VPN Editions. These packages enable superior protection by providing the right services for the right location. At the same time, they enable standardization on the Cisco ASA 5500 Series platform to reduce costs in management, training, and sparing. 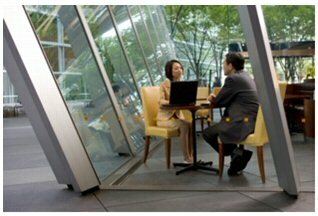 Finally, each Edition simplifies design and deployment by providing pre-packaged location-specific security solutions.